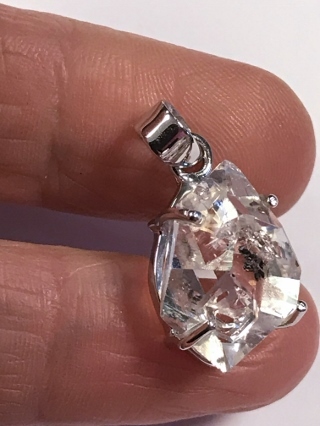 A 925 silver claw set Herkimer Diamond pendant. This form of quartz is called a diamond because of its double terminated shape, clarity and rainbow inclusions. It is valued for clearing all chakras and stimulating psychic abilities. It is used as a transformation tool in realigning to soul purpose because of its detoxification properties.